There are many high quality cultural institutions in Hillsborough County that offer field trip experiences. Teachers and parents can browse below to learn about these opportunities and then contact these institutions directly to make a group reservation. 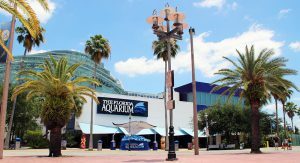 Go from tree level to sea level while being entertained and educated at The Florida Aquarium! With more than 20,000 animals including sharks, alligators, seahorses and more, you’re sure to have an amazing aquatic experience. 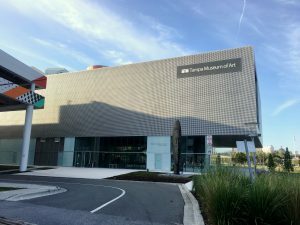 The FLORIDA MUSEUM of PHOTOGRAPHIC ARTS is a museum dedicated to exhibiting important photographic art as central to contemporary life and culture. FMoPA collects, preserves, and exhibits historic and contemporary works by nationally and internationally known photographic artists. FMoPA also enriches the community by operating outreach programs to educate children and adults. 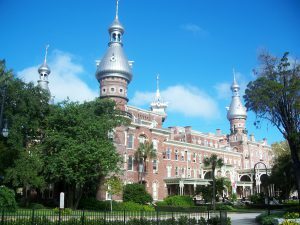 University of Tampa, 401 W. Kennedy Blvd. The Henry B. Plant Museum interprets the Tampa Bay Hotel at the turn of the century; the Victorian lifestyles and history of America’s Gilded Age; the life and significant contributions of the visionary builder, steamship and railroad magnate Henry Bradley Plant in the development of Florida and Tampa Bay; and the role of the Hotel in the Spanish-American War. Through educational exhibits of original furnishings and artifacts and a dynamic docent-led tour, students are transported to the late Victorian period and immersed in the opulence of the Tampa Bay Hotel and its rich history. Starting November 18, 2017, the Museum of Science & Industry (MOSI) will offer a re-imagined, jam-packed hands-on science learning experience. More than 100 engaging exhibits will fill a remodeled space on MOSI’s longtime campus at 4801 E. Fowler Avenue. 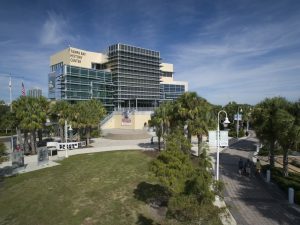 The History Center is a 60,000-square-foot museum focused on the history and heritage of Florida and the Tampa Bay region. 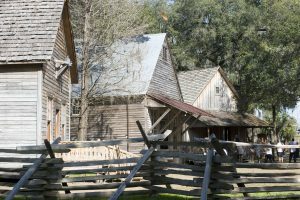 From the earliest native peoples and Seminole Wars, to the growth of transportation and industry, the History Center covers 12,000 years of Florida’s past. Sail across unknown seas with European explorers, ply the Florida coast alongside pirates and privateers, and dive to the ocean floor in search of long-lost fortunes in the all-new Treasure Seekers: Conquistadors, Pirates and Shipwrecks gallery. From the infamous pirate Jack Rackam, to the hard-charging Teddy Roosevelt, the Tampa Bay History Center’s three floors of exhibits explore the stories and personalities from Florida’s past. Florida History Exibit Themes include: Florida’s Native Indians, Florida’s Early European Explorers, Seminole Wars & Culture, Founding of Tampa & “Cigar City”, Tampa Bay Timeline, Industries & Natural Resources, Sports & Recreation, Civil Rights in Tampa, Tampa’s War Heroes, Pioneer Florida, Trans-Atlantic New World Exploration, Navigation Tools, The Pirate’s Life, Florida Shipwrecks and Artifacts Recovered. Finding your way at sea is a complex art. Captain and crew must not only possess expert knowledge of geography, tides and weather, they also require the latest technology to ensure a safe voyage. A new exhibit in the History Center’s Touchton Map Library lets visitors navigate Florida’s coastlines the way sailors had done centuries before the existence of GPS: with a piece of paper. “Navigating in the Age Before GPS: Nautical Charts of Florida and the Caribbean,” highlights the era before satellites and hand-held global positioning software. The exhibit features a dozen large-scale nautical charts dating back to the late 1700s, focusing on the coastal areas along the Gulf of Mexico, Caribbean Sea and the Atlantic Ocean. As seemingly sprawling and sparse as the waters and coastlines they depict, the charts in the exhibition present an array of details and information, from depths to shipping routes, sandbars to long-forgotten coastal cities, islands and ports. The chart “An Accurate Draught of the Gulph-Passage from Jamaica with the West end of Cuba &’c” from 1796 depicts important sailing waters of the “Gulph-Passage” between the two islands, while its title reflects the growing importance in English overseas trade at that time, especially sugar and rum. Meanwhile, “Progress Sketch Sec. VI – West Coast of Florida – Tampa Bay and Vicinity,” printed in 1879, shows several bay area landmarks, including one of the earliest mentions of south Tampa’s Ballast Point. As with all of the charts presented in “Navigating,” each was created without the benefit of satellite technology, or even airborne observation. This comprehensive exhibit details the establishment of Florida’s Coastal Island Sanctuaries as well as local entities involved in Tampa Bay’s wildlife and water quality recovery and protection. Symbols and drawings of birds appear on the earliest artifacts of modern humans. Birds’ ability to fly, the beauty of their feathers and their varied songs have drawn people to them for centuries. In some ancient cultures, birds were omnipresent – as protectors, hunting aids and transporters to the afterlife. Owls and hawks, especially, were thought to represent gods or spirits with special powers. Today, birds are a reminder that nature is always with us, and they are recognized as indicators of the health of ecosystems. Understanding long-distance avian migrations has led to international cooperation as well as scientific advances. Presented by the Tampa Bay History Center in partnership with Audubon Florida’s Coastal Island Sanctuaries staff, “A History of Conservation: A Bird’s-Eye View” traces birds as an important part of mankind’s culture, from the early Greeks and Romans to John James Audubon’s study of North American bird life in the 19th century. “A Bird’s-Eye View” also looks at Florida’s role in the birth of the modern conservation movement, from John Audubon’s travels throughout the state in the 1830s, to Theodore Roosevelt’s time in Tampa and his subsequent naming of Tampa Bay’s Passage Key as one of the first federal bird reservations. 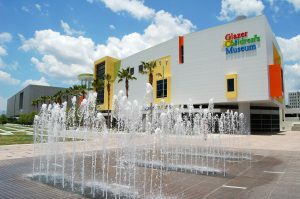 Docent-led tours at the Tampa Museum of Art focus on connecting students with the Museum’s collections and special exhibitions. They inspire an understanding and appreciation of the visual arts. Students are encouraged to use critical thinking and viewing skills to connect the art on view with their studies and their own life experiences. Volunteer docents lead tours based on current museum pedagogical theory and classroom curricular standards. The USF Contemporary Art Museum organizes and presents significant and investigative exhibitions of contemporary art from Florida, the United States and around the world. Changing exhibitions are designed to introduce students, faculty and the Tampa Bay community to current cultural trends. USFCAM underwrites new projects by emerging artists, and maintains the university’s art collection of more than 5,000 works. Educational programs include InsideART, a free online secondary school curriculum that integrates social studies and science with contemporary art. Graphicstudio is an ongoing experiment in art and education at the University of South Florida, where leading artists from around the world are invited to work in residence to produce limited edition prints and sculpture multiples. Faculty and staff of Graphicstudio collaborate with visiting artists to realize projects that would not otherwise be possible without the assistance of Graphicstudio’s printmaking and sculpture experts. 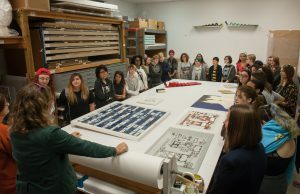 Tours visit each aspect of Graphicstudio’s facility: the main gallery space, curating, lithography, and etching, view printmaking demonstrations in either lithography or etching, and each visitor receives a small sample of a print produced at Graphicstudio. Up to 30 students at a time can tour the facilities. There is no charge for Public School field trip groups. To make a reservation, contact Mark Fredricks at least two weeks in advance at fredricks@usf.edu or 813-974-3503. 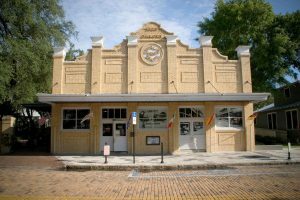 The story told at the Ybor City Museum State Park begins in 1885, when Vicente Martinez-Ybor arrived to established Tampa’s renowned cigar Industry. From a small fishing village of 750 residents, the population grew quickly as Spaniards, Italians, Cubans, Romanian Jews and Germans, immigrated to Tampa to work in the cigar industry or to provide goods and services to these new residents. The museum tour includes exhibits on the cigar industry, Ybor City’s diverse immigrant population, the social clubs and mutual aid societies, cultural, political and social activities, a special exhibit entitled Traces of Cuba a recreated cigar-worker’s home and the Mediterranean-style garden. 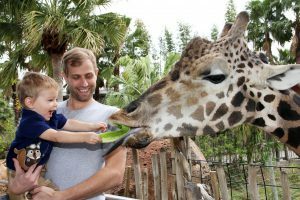 Five-time winner of the TripAdvisor Certificate of Excellence (2010-2015), Zoo Tampa at Lowry Park is one of the most popular zoos in the southeastern U.S., with over 1 million visitors annually. Since its inception, Zoo Tampa has grown to what now encompasses 56 acres of naturalistic animal exhibits in a lush, tropical garden setting. The Zoo offers popular educational programming, fun recreational amenities, up-close animal encounters and engaging seasonal events for which it has won accolades as one of the country’s most family-friendly zoos. and the supports that enable each student to excel as a successful and responsible citizen.